I hope to play the game tomorrow or on Saturday. 5) Loewendahl (Dash.) - Anjou Cav. Maybe it will be a good idea to open the map in a second window. We had the idea that my wife and our friend would play and I am the umpire and would serve as Traun / Coigny. They rolled dice and my wife with the higher roll got the French. First prince Charles decided to advance with his light cavalry through the village of Roeschwoog. The French dragoons and hussars under the Chevalier de Belle-Isle and the comte Berchény aproached at Suffelnheim. 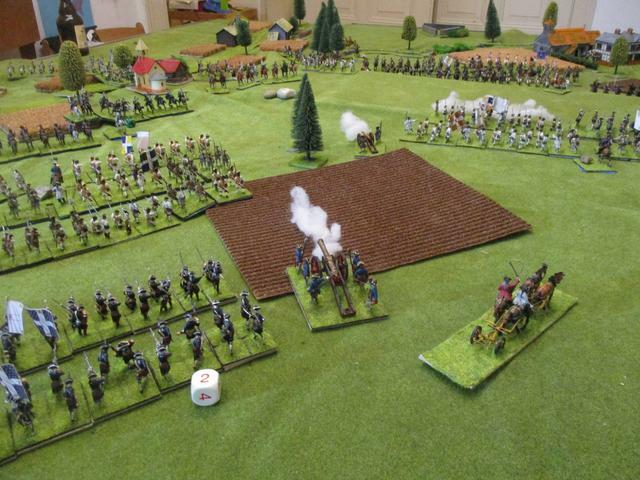 Prince Charles was convinced that it was the best idea to stop the French on the ground far away from the villages. 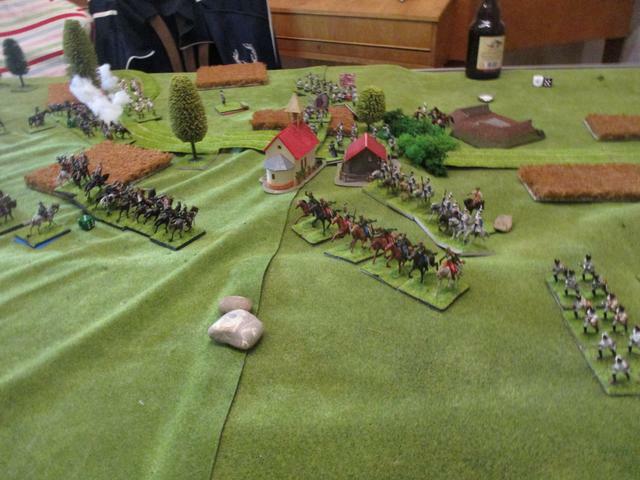 Therefore Ghilanyi had to leave his position and attacked Loewendahls cavalry, which was surprised. Bärnklau ordered one of his batallions to occupy Suffelnheim. His other troops were commanded to stop the French dragoons. The maréchal de Noailles was not idle and advanced as fast as possible. The duc de Coigny recommended that the guns should fire. A great simple plan or a stupid old fellow? At Noailles' right wing the Situation became even worse, when Ghilnanyi attacked again. Prince Carl saw no chance but to cross the Sumpfbach with all forces as soon as possible, because the first French infantry under the prince de Clermont was eager to engage Ghilnanyi, who would have no chance to stop 4 bn.s of infantry and some artillery. Loewendahl's second regiment was soon defeated and routed. 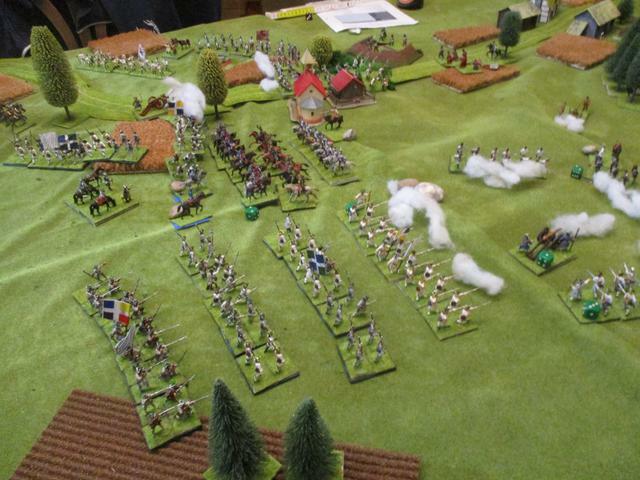 Not a good beginning of the battle for the French. They had to rely now on their left wing. Belle-Isle was cautious - much to the surprise of Bärnklau. But Berchény had spoken inspiring to his Hungarian friends and they attacked one of Bärnklau's batallions in the flank. 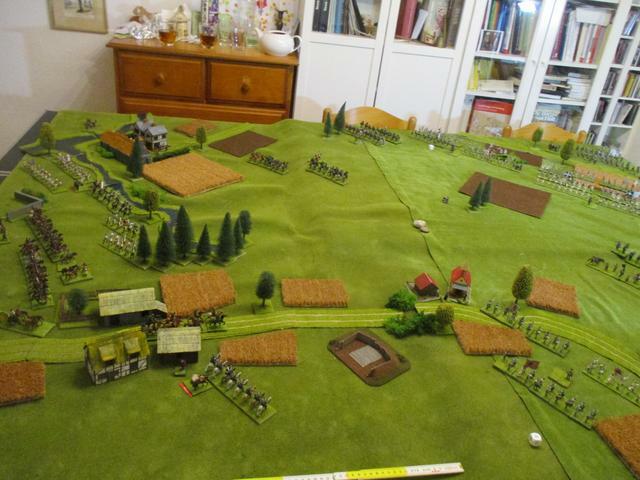 However the Austrian fusiliers could retreat in safety. Now it was more important than ever, that the French could break Bärnklau's resistance before Daun and Trenck arrived with reinforcements. 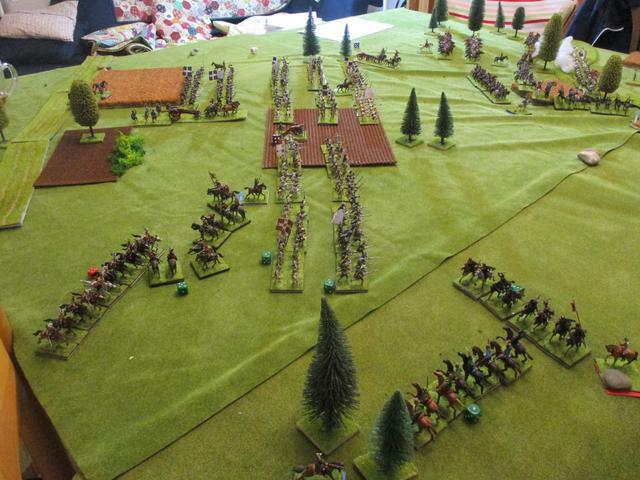 But the French left wing needed infantry to assault Suffelnheim. I hope you enjoy the game? Finally Coigny recommended that Noailles' presence was important. The French ordered d'Eu to advance at Suffelnheim. The French artillery brought the heavy artillery in the position to bombard Nadàsdy's hussars which were coming to reinforce Bärnklau. 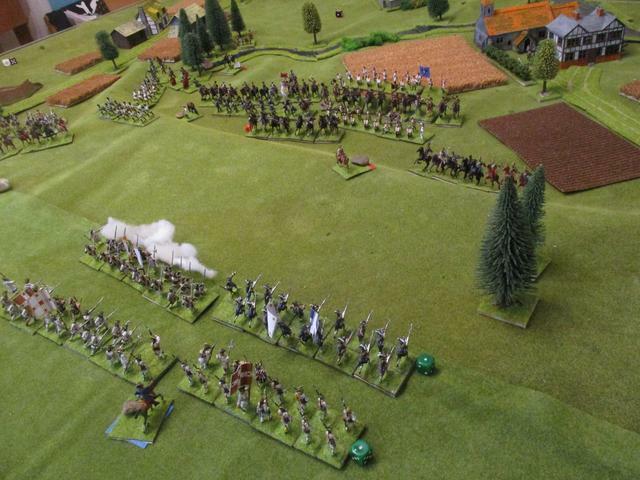 Berchény noticed the danger to be hit in the rear by Nadàsdy and pulled back his brigade. At the same time the brave prince de Clermont arrived in front of Auenheim for revenge. He could hit Ghilnanyi, who wanted to retreat as soon as possible. 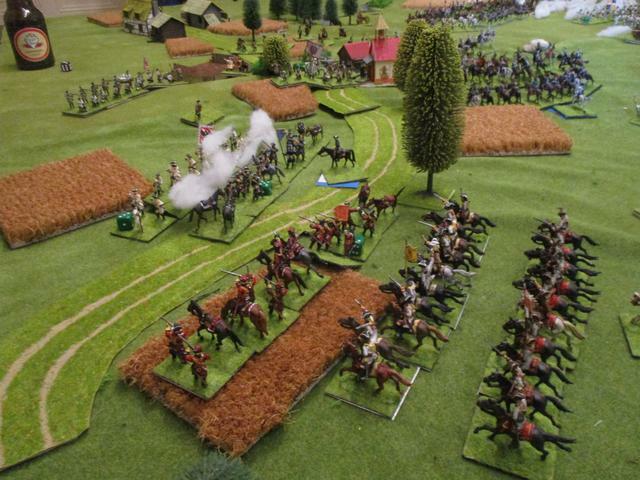 Belle-Isle was cautious, but finally he spoke too inspiring and his dragoons of the Regiment du Roi charged Bärnklau's fusilieres, but were routed. 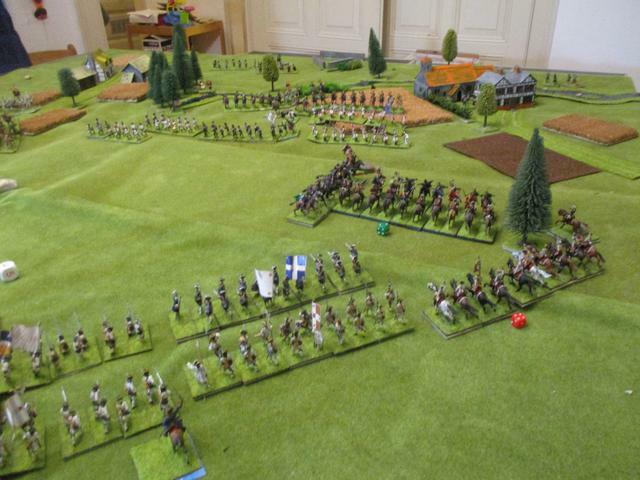 To make things even more desperate, Nadasdy-hussars attacked Berchény's Pollereski-hussars and routed them too. That was still not enough. The Nadàsdy-hussars charged the Berchény-hussars too. The Bercheny hussars were defeated and now the Maréchal de Noailles and the Maréchal de Coigny were in danger to be captured. At the same turn the Austrian decided to one for all smash the French right wing. Daun and St. Ignon charged the Brigade under the prince of Clermont, who advanced slowly at Auenheim. Prince Charles of Lorraine was convinced that he had to stop them by attacking. Daun's charging fusiliers were routed while St. Ignon's dragoons retreated towards Auenheim. Daun had thrown one unit of Grenadiers into Suffelnheim to defend the village along with Bärnklau's fusiliers. Trenck formerly occupied Roeschwoog with half of his men, but later send them forward to take position in the redoubt directly behind Suffelnheim. D'Eu led his artillery shoot grapeshot into the streets of Suffelnheim, where Bärnklau's garrison finally suffered heavy casualties. Now the French had all troops together for significant assaults at Suffelnheim. 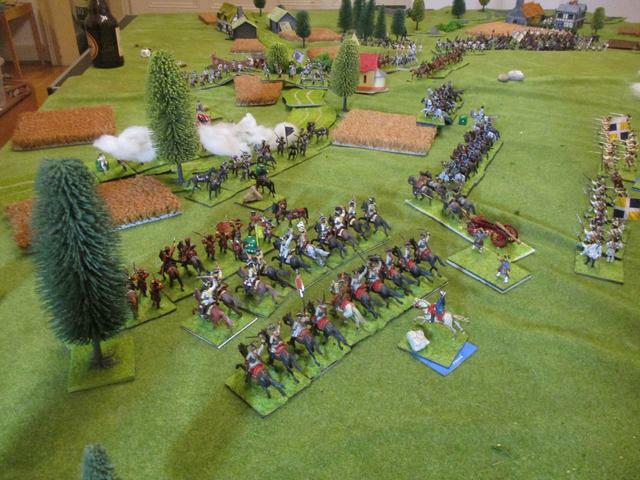 Nadàsdy's own regiment of hussars was too much inspired and charged the French infantry in front of them - to be routed. 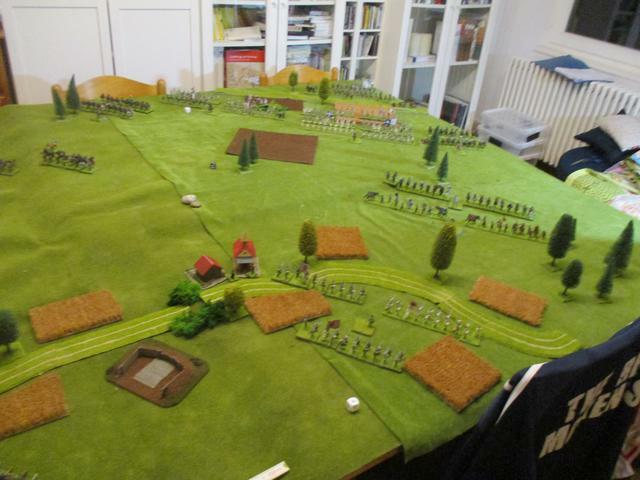 Meanwhile D'Eu and Clermont-Tonerre tried to finish off Bärnklau's forces. After Routing the first bn. of Bärnklau's corps, the French horse stormed into the second, which failed to face the attackers. 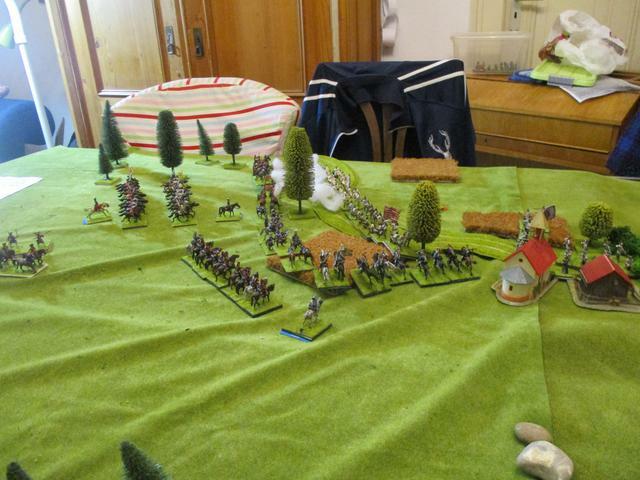 They were defeated too, leaving Bärnklau for now in no shape for further defence, althoul the Feldmarschall Leutnant had defended Suffelnheim for 5 turns! The defenders of Suffelnheim had to retreat. 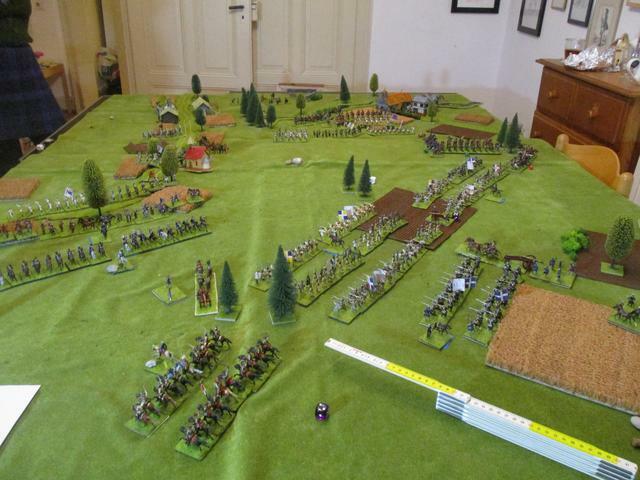 Daun ordered his Grenadiers to leave the village too and stabilize the Austrian center, where Trenck used some of his light troops to fill the gaps. 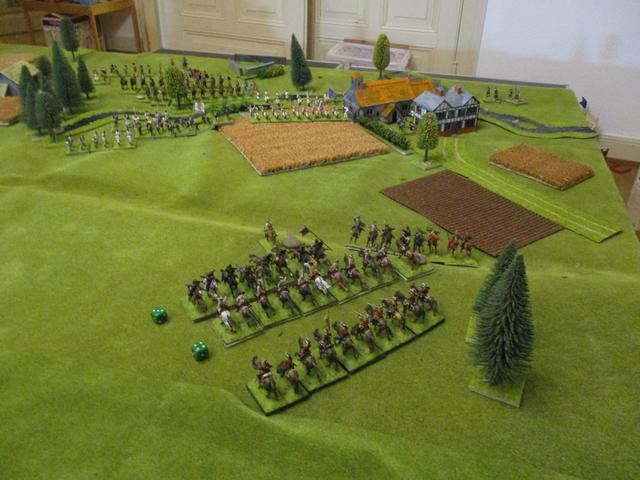 After loosing his melee, half of St. Ignon's dragoons had retreated towards Auenheim, where now Loewendahl was eager to get his revenge and used his last unit to charge the reforming dragoons successfully. But at the same moment St. Ignon did something very similar attacking one of Clermont's batallions. 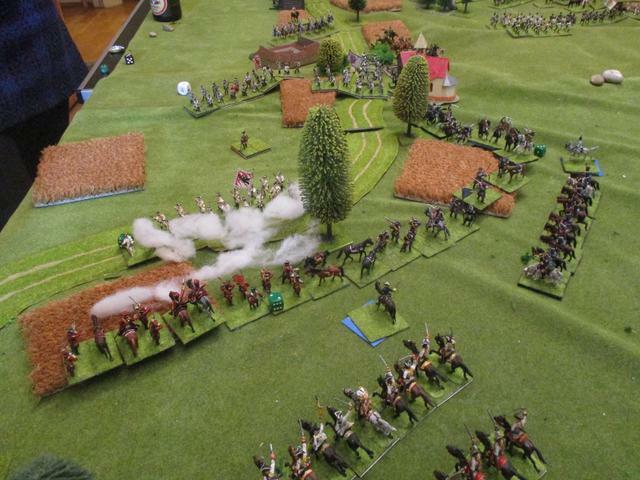 The poor lads were routed, but there the success of the Austrian dragoons was hold. It was in the center, where the last French try to break through was blocked by Daun's Grenadiers, who charged the leading batallion of d'Eu's massive column. 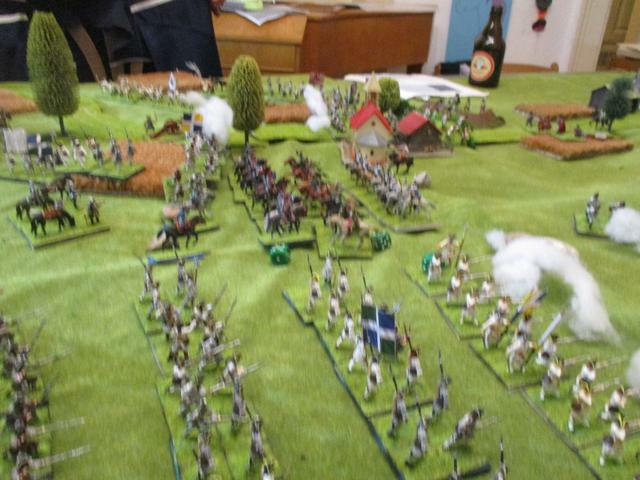 The French were routed and that brought the fighting. It was too dark to fight. 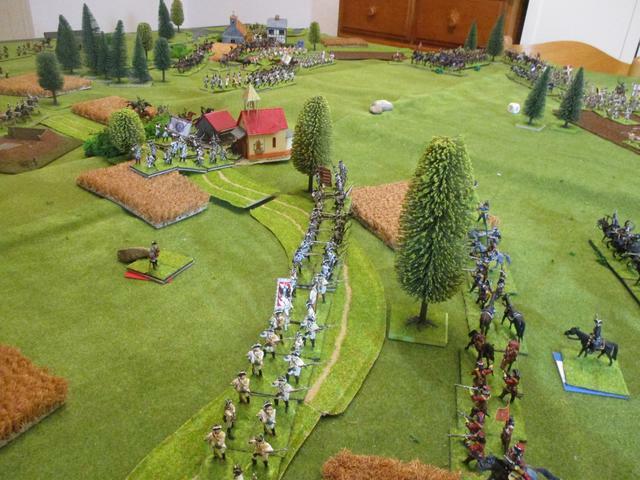 The French could not use their heavy artillery for the last 3 turns, because the canons were too slowly and the French crews could not find the targets due to darkness. The battle was declared an Austrian victory. They hold 2 of 3 villages, although no Austrians were in Roeschwoog. 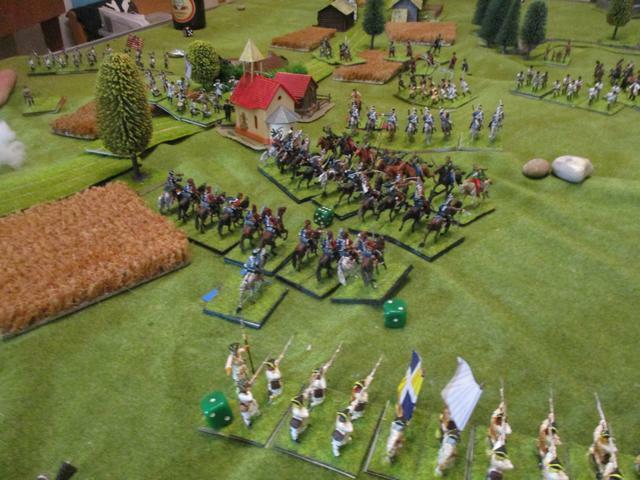 The Austrians lost 5 of 9 Points, while the French lost 7 of 12. I think that both ladies played the game very well and I think that my advice was not important at all for the outcome of the battle, although I played the foolish foppy old Coigny who did little to help de Noailles, only recommending the use of the 3 batteries. Hi Dindin, I hope you would Play the Scenario and could tell what you think about. Historically the French guards never made it on the battlefield. But I fear that it's unlikely that the French could take Auenheim in time. Maybe 2 villages are a more realistic objective. I'll try the scenario, for sure! And you just said what I wanted to remark: For the French to take all three villages is nearly impossible, so 2 villages is more realistic, for sure! In your game I think that you had not luck with your side, but also your opponents were very tough! 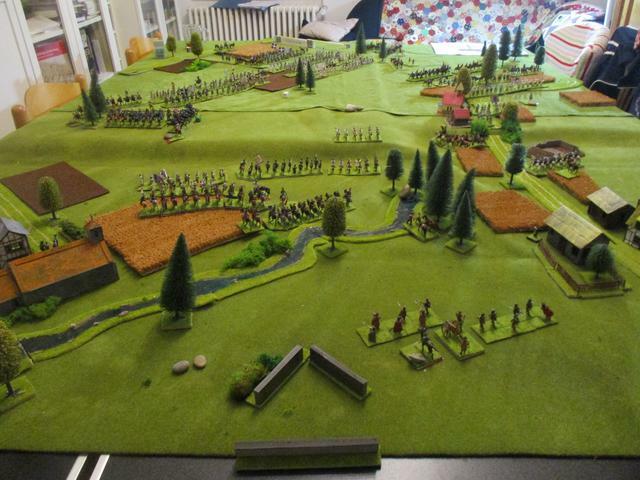 These French could not easily achieve a victory in actual history, not in a game, either! I was the umpire, which was nice for a first try of your own scenario. Besides I was Traun and Coigny just to make both leaders confused. I changed the victory conditions. I think that it's not impossible for the French to take one village - Suffelnheim for example, if they use Eu's large number of troops and can give Daun too much to do, that he could not reinforce Bärnklau.